Offering payment plans (or installment plans) to your customers is sort of like selling a subscription with recurring payments. The only difference is that with payment plans the “subscription” ends once the product has been fully paid for. Therefore, in Cart66, a payment plan is just a subscription with a fixed number of billing cycles. Cellercisers are a little bit expensive. Depending on the model, you can pay over $500 for one. Normally we might sell the Bi-Fold Cellerciser for a one time payment of $400. Often times with a payment plan you charge a little more since you aren’t getting all the money up front. So, let’s offer a Cellerciser to our customers on a payment plan for 5 payments of $95 dollars. That will be a total of $475 once all the payments are made and a monthly payment of $95 seems like a nice price to offer customers. Log in to your Cart66 Cloud dashboard and navigate over to your Products tab. Either create a new product or select a product that you would like to sell on a payment plan. 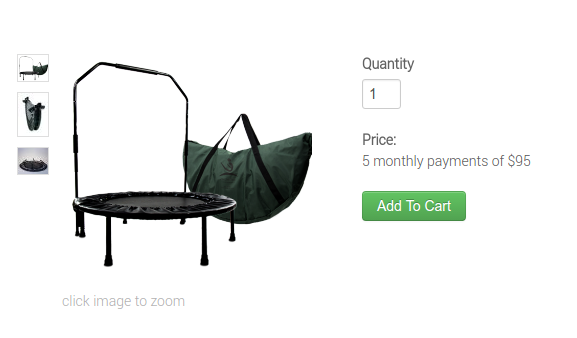 In this example we’re going to be selling a Cellerciser which is a mini-trampoline that you can use for exercising. Side note, I have been working out on a Cellerciser for over 5 years and it’s really great. You may want to try one out. Set up the Basic Info for your product as shown below. When you get ready to set the price, click the is this a subscription link next to the price field. That will take you over to the Subscription settings for the product. 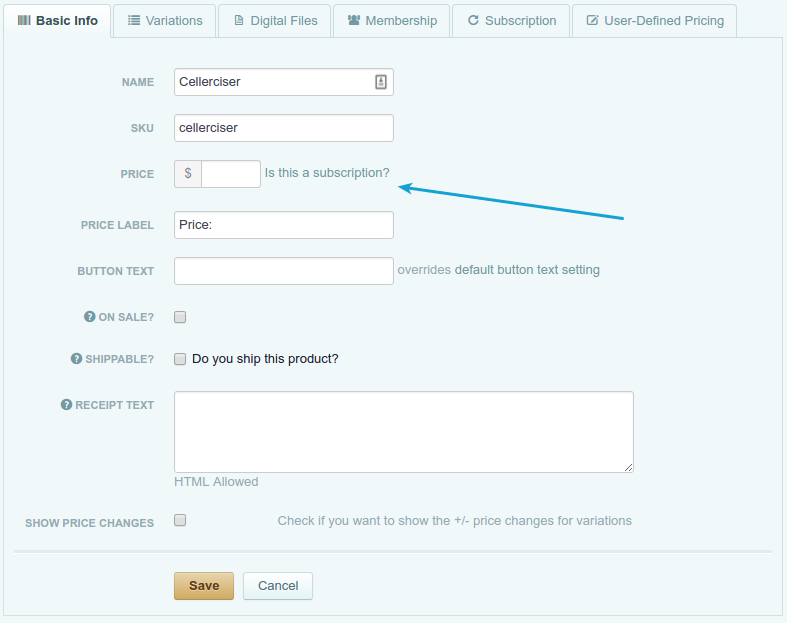 Let’s enable subscriptions for this product by clicking the Enable Subscription button here. The two most import fields are the Recurring Price which is the amount paid in each monthly installment and Billing Cycles which will determine how many payments are made. Since we want to charge $95 per month for 5 months, we set the Recurring Price to $95 and the Billing Cycles to 5 times. 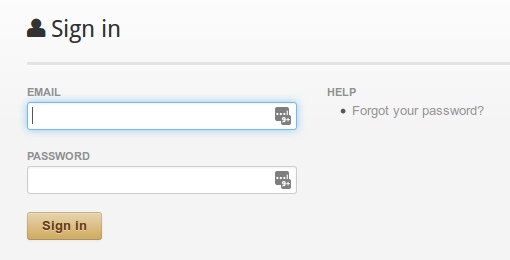 Click the blue Customize button next to the default price description and enter in your own custom description. After saving the product, you will see it listed in your Cart66 Cloud dashboard with your new custom price description. Going back to look at your product on your WordPress site, you will see that the custom price description is shown and the Cellerciser is now available for purchase on the payment plan of 5 monthly payments of $95. 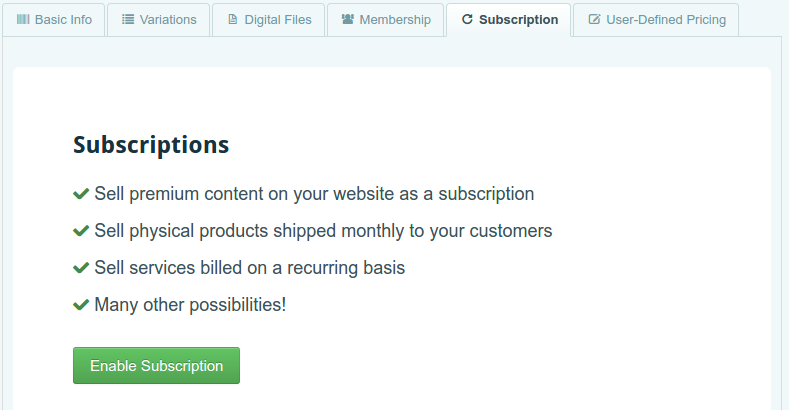 When a customer places an order for a product that you are offering on a payment plan, you will see the payment plan in the list of Subscriptions in your Cart66 Cloud dashboard. 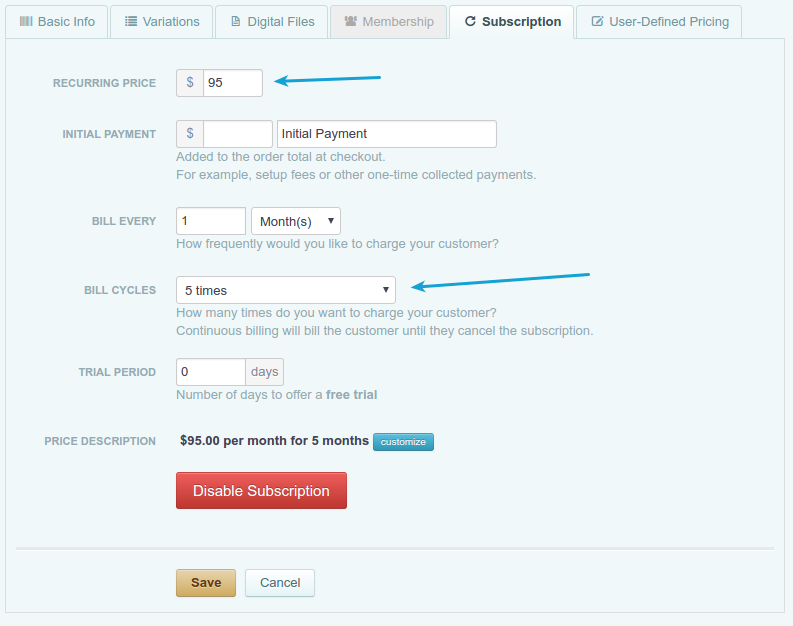 You will also see be able to access the payment plan information in the Orders section of your Cart66 Cloud dashboard. It is common for products that are offered on a payment plan to be marketed like the As Seen On TV products with big, exciting Buy Now buttons that put the customer on the payment plan. The design of your site is extremely flexible with Cart66. You can make your own Buy Now button and create things like this. We have a complete tutorial on how to create and use Buy Now links. The general idea is really simple. All you need to know is the SKU you created for your product then you wrap the Buy Now image in a link tag like this. In our example, we created a product with a SKU of cellerciser and our subdomain is secure-store. So our buy now link for the Cellerciser would look like this. Where IMAGE is the image tag for your buy now image. Since this is just an image used as a link, keep in mind that you can use this exact same technique anywhere you can use a link. For example, if you are sending out a newslettter email, you could include a Buy Now button in the email which, when clicked, will take your customer directly to the checkout page ready to buy your product on the payment plan. If you are comfortable writing out the Buy Now link yourself, you can generate the link from your Cart66 Cloud dashboard then copy / paste the link wherever you’d like to use it. To generate the link, go to the Products page in your Cart66 Cloud dashboard. Next to the product that you want to work with, click the blue Goodies button and click the Buy Now Link option. Then you will see a pop-up modal window where you can click a button to copy the link to your clipboard. Your customers will have access to manage their payment plans on your site as well. For example, if a customer needs to update the credit card on file, or just wants to check in on the status of the order to see how many payments have been made, all of that information is available in your secure customer portal. Once signed in, you customers will have access to their order history, saved addresses, saved credit cards, etc. This is where your customers can update the credit card they have on file and see the details about when the next payments are due. Using a link to your secure customer portal is the simplest way to give your customers access to manage their account and their payment plan. If you would like even more control and even provide some pages on your WordPress website that are only available to members, you may want to use the Cart66 Cloud Members plugin which will give you access to additional features for managing access to content on your website as well as a sidebar widget that will let your visitors sign in to the customer portal. The Cart66 Cloud Members plugin is a powerful add-on that will let you sell access to content on your website and restrict content to people who have purchased a membership or subscription from you. For more information, take a look at how you can run an online magazine with the Cart66 Cloud Members add-on plugin. For managing payment plans, you probably do not need all of the features that come with the Cart66 Cloud Members add-on, but you could apply those same techniques if you wanted to provide some “members only” content on your site. For most people, adding a Sign In link or a Manage Your Account link that directs your customers to the secure customer portal at your Cart66 Cloud subdomain will be what you want to use. We have looked at how you can sell your products on a payment plan in Cart66 by setting the product up as a subscription with a fixed number of billing cycles. You can set your own price description to make your payment plan pricing more clear to your customer. For example, you can set the price description to something like 5 monthly payments of $95. 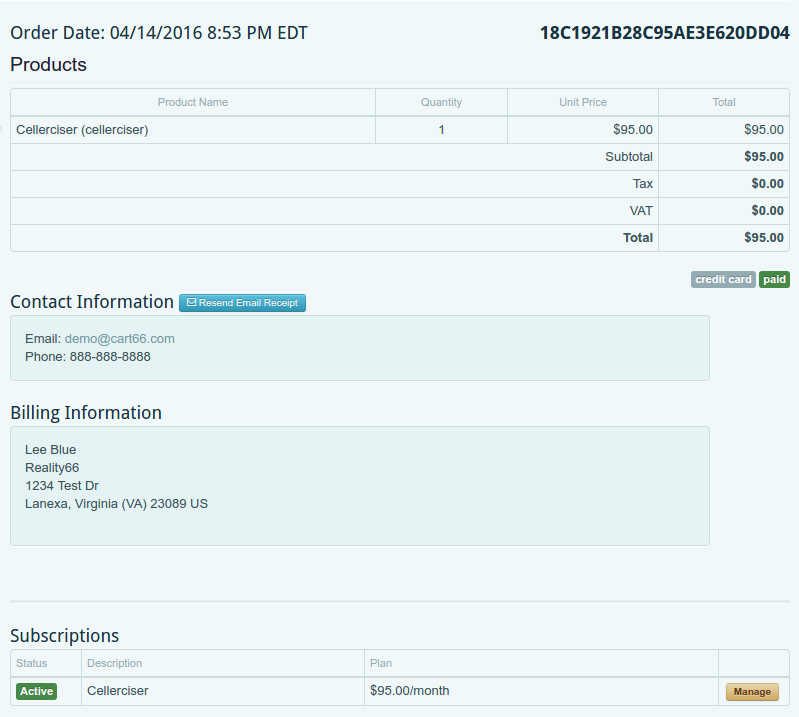 Once your customer places an order, you can see all the details of the payment plan in you Cart66 Cloud dashboard such as when the next payment is due and when the order will be completely paid for. If you would like to market your payment plan with custom designed graphics and buttons, you can wrap any image in a Buy Now link. This gives you complete control over how your site looks and how you want to advertise your payment plan products on your website.